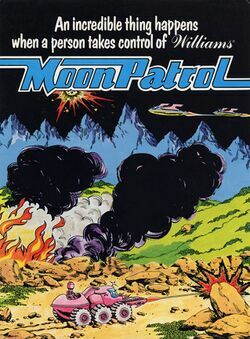 Moon Patrol is a unique side scrolling shooter game in which you piloted a moon buggy that had to cross the rocky and pitted terrain of the moon while avoiding attacks from over head alien crafts. 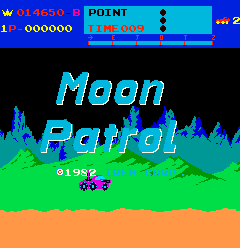 As you proceeded across the surface of the moon, several layers of the background scroll by independently, making Moon Patrol the first game that featured parallax scrolling. Moon Patrol was developed in Japan by Irem, but its success occurred when it became popular in America thanks to the distribution by Williams. Atari saw the game as a hot title to bring home and bought the rights to release it for home systems. They released it on several of their own platforms, and developed the title for other platforms through the Atarisoft label. It has since been included on several classic Midway collections. Take the role of a Luna City police officer assigned to Sector Nine, the home of the "toughest thugs in the galaxy." This page was last edited on 7 January 2014, at 02:06.